Scores of homeless, barred from Community Action Partnership of San Luis Obispo’s homeless services, spend their days begging for food, looking for shelter and avoiding city police who target them. CAPSLO receives more than $60 million in government funding and support each year to provide services to those in need, including San Luis Obispo’s homeless population. But, the homeless are required to follow a set of rules imposed under the tenure of Dee Torres, homeless services coordinator. If the homeless don’t follow the rules, they are suspended or barred from receiving help. Peggy Fowler, a former 20-year employee CAPSO’s homeless services, says the refusal to provide food to homeless barred from services is not only cruel, but also increases the likelihood someone will resort to stealing in order to eat. The rules include a ban on giving food to homeless persons who have been suspended from the program, entering the Prado Day Center through the driveway on foot and failing to control the physical tics and other behaviors resulting from medical conditions or mental illnesses. If a homeless person fails to follow Torres’ rules, she bars them from receiving meals and a place to sleep and shower, according to the program’s rules and dozens of citations CCN staff have viewed. Many of those barred are refused services for months or years because they are unable to make it through a laborious readmission process Torres has put into place, Fowler said. Erica Merchado has received several suspensions from CAPSLO’s homeless services, despite having a terminal illness, former 30-year employee Estella Bonds said. Merchado, 32, has Huntington’s disease, which causes her arms to make constant involuntary movements. She was diagnosed with Huntington’s when she was 21 and entered CAPSLO’s homeless services two years later, Merchado said. Merchado utilized the services for more than five years. CAPSLO last suspended Merchado about three years ago for taking her lunch out of the Prado Day Center to the bus stop on Prado Road, Merchado said. Staff also suspended her for taking food from the day center to a suspended homeless client, Bonds said. 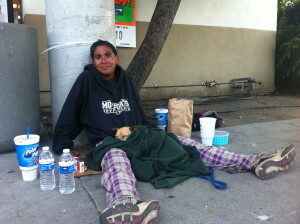 Merchado now sleeps under the Madonna Bridge and spends much of her day sitting outside Circle K on South Higuera Street with other homeless who beg for food. One rule strictly enforced by CAPSLO prohibits the homeless from coming within an eighth of a mile, or 660 feet, of the Prado Day Center between 4 p.m. and 8:30 a.m. and within an eighth of a mile of the Maxine Lewis Memorial Shelter between 7:00 a.m. and 5 p.m. Torres enforces the policy because her employees are afraid of the homeless, so she wants the homeless out of the area when employees are coming and going, she said. If a staff member sees a homeless person, or even property belonging to a homeless person in the restricted area during those hours, it results in a suspension from services, according to CAPSLO rules. While suspended from services, the homeless can still incur more penalties. Many short suspensions compound into longtime bans, said Joette Sunshine, a former employee of homeless services who worked there for four years. When a homeless person is suspended from services, that person is only allowed to enter the eighth of a mile zone surrounding both the day center and night shelter during one 15-minute time slot each day. If a homeless client wants obtain a print out of violations committed or acquire an application to re-enter services, the person must get in and out of the day center restricted area between 11:00 a.m. and 11:15 a.m. and the night shelter restricted area between 7:00 p.m. and 7:15 p.m. Failure to do so triggers an additional 30-day suspension. Michael Pryor, an out-of-work computer technician and a former singer, received a 30-day suspension for cheating CAPSLO’s lottery system in an attempt to secure a bed in the shelter on a rainy night. Pryor used a ticket from an earlier night that someone had given him, and CAPSLO staff caught him. Though Pryor received only a 30-day suspension, he is now suspended from services for 270 days because CAPSLO employees have spotted him within an eighth of a mile of the day center and night shelter outside of the 15-minute time slots, Pryor said. Pryor sleeps outside. One day, he went to the shelter on a cold, rainy night to ask staff for a blanket. CAPSLO staff refused him a blanket and instead gave him an additional 30-day suspension for entering the restricted area. Tiamoyo Peterson quit working for CAPSLO’s homeless services several years ago after taking her concerns of the treatment of the homeless to CAPLO’s CEO Elizabeth Steinberg, Peterson said. Peterson, who has two masters degrees and a doctorate in social psychology, said she became concerned when Torres kicked out a homeless woman in her late 20s because the client was not always able to control her schizophrenia and would be obnoxious at times. Steinberg promoted Torres to the top position in homeless services around the same time a countywide Homeless Services Oversight Council was created. In 2008, Torres’ boyfriend San Luis Obispo County Supervisor Adam Hill became the founding chair of the Homeless Services Oversight Council, a group with a plan to end homelessness in 10 years by promoting a 200-bed shelter to be managed by Torres. Those staying at the shelter are to be required to give 50 to 70 percent of their income to case management allegedly to be used to get them into housing. Several law enforcement agencies are looking into allegations that those managing the required savings accounts have been misappropriating the funds. Together with San Luis Obispo City Councilman John Ashbaugh, Hill and Torres have worked to have the city and the police increase enforcement against homeless who refuse to enter case management. Both Ashbaugh and Hill have regularly voted to provide government funding to CAPSLO. Ashbaugh sits on the CAPSLO board of directors and Hill is engaged to Torres but both men say there is no conflict of interest. Earlier this year, the San Luis Obispo City Council voted to have police increase ticketing of homeless who do not participate in case management. The SLO Downtown Association recently asked those in favor of supporting CAPSLO’s homeless services’ programs and who want the city to dedicate two police officers to focus on transients downtown to sign an online petition. San Luis Obispo Chief of Police Steve Gesell says his department neither categorizes people, nor enforces the law based on status. “We are trying to enforce the law equally but it would be foolish of us not to understand the dynamic of the homeless transient population,” Gesell said. In 2012, San Luis Obispo police officers cited 605 people for breaking Penal Code 647(e) which makes it a misdemeanor to “lodge in any building, structure, vehicle or place, whether public or private, without the permission of the owner or the person entitled to the possession or in control of it.” In the rest of the county, only one person was cited for breaking Penal Code 647(e) in 2012, according to records requests received from all community and county law enforcement agencies. Gesell says his department is utilizing 647(e) as a way to combat the environmental impact human waste from homeless campers has on the community. He refers to those homeless not utilizing CAPSLO’s services as program resistant. SLO police officers are giving 647(e) citations to homeless found sleeping in parks, on benches or anywhere throughout the city. They also routinely roust homeless, including Merchado, who sit outside Circle K, even though customers of the convenience store and the adjacent Subway sandwich shop frequently buy them food. On April 11, former CAPSLO employee Estella Bonds visited Merchado outside Circle K, and when a police officer arrived he not only scolded Merchado, but Bonds too. Bonds told Officer Lincoln that she was not homeless and he stopped ordering her to leave the area. Defending CAPSLO’s rules and penalties, Torres and Hill said at a SLO City Council meeting last year that homeless people need structure and management. After the meeting, former Councilman Andrew Carter said that the rule against being on Prado Road should be followed to discourage homeless from bothering business owners. I just listened to Peggy Fowler on KVEC 920. She worked at the SLO shelter for over 20 years, 19980-2009. It’s clear that the administration is incompetent and do not follow proven methods for servicing and empowering the homeless. In fact they’re (CAPSLO management) dysfunctional and even obtuse in their reasoning. Biz Steinberg apparently has an education in something like home economics, what the ?? Tiah (sp) Peterson is the Dr. of Psychology who also left after approaching Biz with her concerns about Dee’s practices concerning the mentally ill and her fundamentally unsound approach to ‘punishment’. Dee is academically bankrupt in this field but does hold an ‘unrelated’ AA. It’s clear that this organization has somehow managed to create high paying jobs for their elected (themselves) in a field that they’re not qualified to practice in. They have also spoofed the gubmint which isn’t difficult to accomplish for millions in grant funds. The CAPSLO organization needs to be down sized and completely re-organized. I suggest that people have a look at the Grand Jury report that can be located on the county website for more info regarding CAPSLO and the hiring of incompetents where the HSCC (founded by Adam Hill) is concerned. It is noted that all the HSCC has done in all these years is hired a paid Director who is noted as incompetent in the report! Hey, I didn’t hear the show. Can you please tell me who Dave had on to respond to the allegations? The audio will be available in a day or so. Dave took phone calls from those who wanted to respond. You do know that Dave has offered an open invitation in the past and I’m sure it still stands to Dee and or Biz or other CAPSLO management to be guests on the show but they have all declined to tell their side. The CAPSLO gang with Adam hill in the lead would rather run around behind the scenes posting all sorts of sophomoric nonsense on blogs like topix. Adam has gone so far off the deep end that he has accused Karen, Dave Congalton, Mike Brennler and others connected with the investigation of just about every bizarre fault that one can imagine. It’s become a literal joke and I do mean literally funny as Hill and Torres desperation is so transparent to all who read the ramblings coming from their floundering fiefdom. Hill has even approached Cliff Barns for help, you can read all about the notorious lifestyle of Cliff as an imposter and criminal at the New Times, they did a story on him a couple of years back. Homer–Would be glad to offer time to an opposing point of view of CAPSLO. There is an open invitation to any responsible party. Interested? If you called Dee Torres or Biz Steinberg and invited them onto the April 29th show, then good for you. If it’s some vague open invitation, not so good for you. Just like CCN has an obligation, if they’re seeking respect as journalists, to call Torres and Steinberg each time they run a story and ask for comments. Then, instead of leaving readers to speculate, report that they called and left messages, or that they declined to comment. Of course, I’m expecting this post to be deleted, as have all other critical of their reporting. We’ll see. “as have all other” Wrong again. And again wtf anonymous complainer on a high nameless horse. You not helping, the guy no one wants to sit next to because it’s a one subject show on and on. Uh, what’s your name again? Peggy Fowler had closer to 30 years of employment as did Estella Barnes! 1980-2009, didn’t Nuvo post no one had been with CAPSLO that long EXCEPT for Biz, that makes 2 employees terminated after such a long time! I cant help but wonder how many other terminated employees suddenly became “bad” after Ms Torres took over? Hmmm, makes you wonder. No I did not post that statement. Mine was to the point of Estella was not employed with Homeless Services for 30 years. In fact she was only with that division for 2-3 years. Estella may have been with another division of CAPSLO but I do not know her prior employment. As for Peggy yes that part is true she was with Homeless Services prior to me being involved with them since 97. Like I stated before I am about the facts and am not trying to mislead the public. My apologies if I mis quoted you. I will look for the post and maybe it was someone else. I apologize for being wrong, it was TruthFairy who posted only Biz has been with the program 30 years. I guess it just seems very strange that so many of the terminated ones could hold positions for a very long time and never had a problem until Ms Torress came into control! How could CAPSLO fail to see the connection between complaints to them and termination of the very same people? Obviously they do not terminated that many people if so many were long term! Normally people prove to be competent within the first 6 months, that’s why employers have probationary periods. I’m listening to Dave Congalton and there are some prior employees on there from CAPSLO. A psychologist (phd) is currently talking about why she quit after many years and it’s very upsetting to hear how inappropriate the shelter is run. I’m in tears hearing about what they did to some of the clients who couldn’t help themselves from being confused. The clients, even an old woman were starved and left to freeze in the cold. It’s despicable how they’re treating the homeless. Nancy: Dee Torres has a minimum of a 20 year tenure at Homeless Services. Dee started out as a regular night shelter worker. She was then promoted to run the Prado Day Center, while at the Day Center she employed several employees in the course of her leadership as supervisor of the day center. Over her tenure as supervisor at Prado Day Center employees came and went for various reasons. Employees work different day shifts. Monday – Friday 8 hours, others perhaps 2 or 3 days a week 8 hours, then you had employees who only worked on Saturday and Sundays 8 hours. Employees who worked M-F never saw nor talked to the employees who worked on Saturday and Sundays, or perhaps an employee might work their 5 day shift which included a Sat/Sun shift. My point is most of these employees did not communicate with each other. Their was an employee who only worked Sat/Sun because she had a regular full-time job elsewhere, Now you add employees that worked for Dee in the beginning of her career with Homeless Services and those in-between years, and then now your current employees. What are the chances all these clients knew each other and all got in kahoots to divise a nasty, controversial ploy against Dee Torres?? For you statisticians: Do the stats on this problematic issue, and what were the chances of this happening?? Come on people if their is smoke, their is lots of fire. Yes the shelter is totally inappropriately run and the even sadder is that all this could have been avoided if corrected action had been taken from Biz when the issues were presented to her personally, to Grace, to Emma, to Catherine-Human Resources, to Jody Smith, to Kathryn Manning!! They were all notified. These clients are but a few of the many that Dee Torres and Shawn Ison have managed to humiliate, demean, marginalize, and just plain ignored these people. Thank you for reading! Awaiting some positive feedback, please. Disney, good observations! Thank you! There may be some employment openings in the SLO county program in the near future, a chance to move up or over. Yes kettle I know what you mean lol!